Blue Ginger Cottage/Mele Hale - 'Happy Home' is situated in the wonderful town of Kailua on the windward side of Oahu. We are the owners living on the property, next to the attached cottage. We are available at your request to answer your questions and share what we know about the islands. Our goal is to provide you with a home-like atmosphere. Your comfort is our top priority. Our concierge is Nicky the cat. He greets all guests but is happy to stay away if not welcome. This is the ideal home for a family with 2 – 3 children, or couples celebrating a special event. It is three blocks to the center of town, and two blocks to glorious Kailua Beach. The property is very private; like a park on almost one half an acre. Feed the birds in the morning. 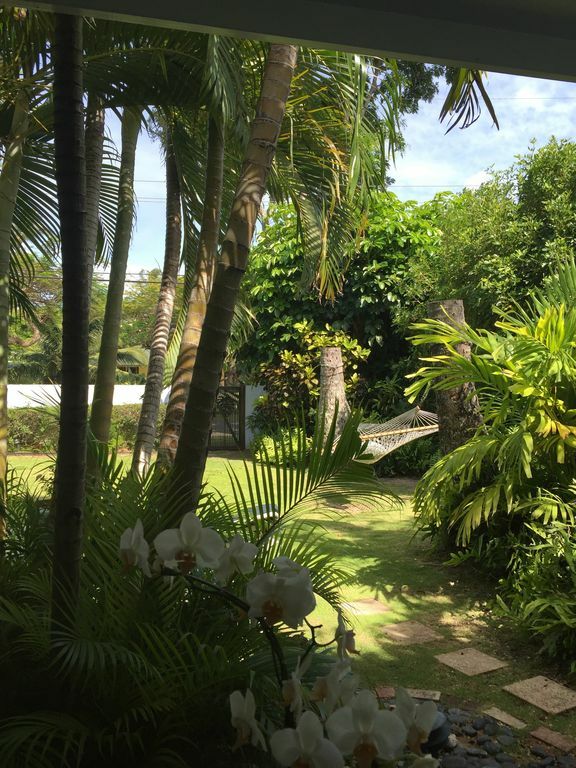 Laze in the hammock; sit on one of two lanais - one off the bedroom in the garden, the other overlooking the pool and Jacuzzi. The back yard has other spots for relaxation - the gazebo and lawn chairs clustered under the lush vegetation . Access to the cottage is through 3 exterior entrances – the sitting area, the bedroom and the bathroom. The inside is bright and very comfortable with 18 foot ceilings, skylights and ceiling fans. Sleeping arrangements are the queen bed in the master bedroom, a double bed in the loft which overlooks the bedroom, and two twin beds in the sitting area. Fresh flowers, fruit, juice, muffins, cereal and coffee are all part of the welcome package. The refrigerator and cupboards have condiments often needed for home cooking; spices, vinegar/oil, peanut butter, etc. The amenities include everything needed for cooking – full size refrigerator with ice maker, microwave, electric skillet, toaster, coffee maker, etc. The outdoor burner on the grill is often used. Most Sundays, a few family and friends gather for what we call 'Bubbly Sunday' - potluck, some prosecco, and sometimes the Jacuzzi. Cottage guests are always welcome. If you are looking for local adventure we recommend hikes, kayaking or, consider paragliding. Come! Join us in paradise. We are kama`aina family living in the islands for nearly 30 years. Each guest receives amenities for breakfast - Juice, Coffee, Cereal, Milk, Fruit, Muffins Refrigerator stocked with fresh condiments - catsup, salad dressings, jam, etc. The Blue Ginger pool is exclusive for our guests available daily from 7:00 AM to 9:00 PM. It is 40 feet long, 10 feet wide and 4 feet deep. Just for lounging, not for diving. Hot Tub and pool are connected. Seats 4 comfortably. There are three cats who love guests who give them treats. Or, guest preference, a spray bottle to shoo them away. If you are allergic, please let me know so the cottage can be sanitized. Two dogs - a Boston Terrier and a big mutt visit often. The terrier is a ball player. My two sons had a blast!!! We are family of 4 with two sons (3 & 7) and Susan make sure we have everything we need before we arrived. Susan is a very attentive and friendly host and gave you the privacy that you need. Our two sons enjoy the pools and the plays with floating dolphins almost every day. They also get to spend time with the dogs (Bella and Beefy) and both of them keep talking about how much they love the place. Thank you, Susan & Claude. Our family of four had the best time here. Close walk to the beachand shops, as well as lots of local eateries. The beach was five mins walk, picture postcard beautiful, and we were able to take heaps of beach gear down in the wagon - all supplied. The unit is self contained and very homely with lots of character. Plenty of space and cool tropical vibes. Susan and Claude were very friendly and hospitable. We absolutely loved the front and back yards. It was enormous and tropical. Kids loved the pool and exploring the elements. We were able to access the property very early in the morning and leave at our leisure as nobody checking in. Such a wonderful holiday for us all. Loved it. Wunderbarer Aufenthalt, wir waren bereits vor drei Jahren bei Susan und Claude und werden bestimmt wiederkehren. Diesmal kamen wir zu viert mit zwei erwachsenen Kindern, es gibt drei verschiedene Schlafmöglichkeiten, somit hat jeder seine Privatsphäre, der Kühlschrank ist groß, die Kochmöglichkeiten absolut ausreichend, Pool und Außenbereich sind herrlich. Handtücher werden jederzeit gewechselt, Kaffee, Obst und Kekse bereitgestellt. Am herausragendsten ist jedoch die Gastfreundschaft der beiden, sie tun wirklich alles um einen den Aufenthalt unvergesslich zu machen, Wir freuen uns auf ein Wiedersehen. We loved this place from the moment we met Claude and Nikki (the cat) to check-in. We soon met Susan and she is just as wonderful. If I was rating on the hosts alone, I'd give it a 10. Adding in everything else, I still give it a 10! We were skeptical of renting here since we are from Texas and the thought of no A/C made us cringe. However, it worked out well. Since we spend our days soaking in the sights and fun of Oahu, it could be 100 degrees in the house and I wouldn't know or care. We came home each evening and it was cool enough for us with the fans on and windows open. Not too mention, it just feels more "Hawaiian" to sleep in the summer with the windows open and have the soft bird chirps wake you in the morning. Only the last night was a bit warm to us because it was humid...felt like a little storm must have been blowing in. We slept like babies on the soft mattress. Our kids slept on the daybed and the bed in the loft. The loft is a bit warmer since it is upstairs. Thankfully, four people can all sleep comfortably downstairs. Susan and Claude provide a generous amount of food to start you off so you don't have to rush to the grocery store as soon as you arrive. We were not in need of anything other than food that week because the kitchen area is well-stocked. The grounds are beautiful! From the pool to the gazebo to the landscape, this place is a peaceful retreat at the end of the day. It is also a simple 3-minute walk to the most beautiful beach on the island!! We'd leave the house at 5 or 6am each day and returned for afternoon swims on multiple days because the beach is so gorgeous. This would be after full days of swimming/hiking/driving elsewhere on the island. Oahu has a ton to offer so make sure you still take time to soak in the beauty right by this home. We love this side of the island because it is so calm and beautiful. It's a perfect way to end a busy day. This is the only VRBO property where I have stayed that I actually posted the link to it on my Facebook afterwards because we enjoyed so much. This place is a must! Condo aside, I also recommend North Shore Shark Adventures as the best thing to do on Oahu. Go at 7AM and then spend the rest of your day on the North Shore. Grab a bite at Ted's Bakery on your way home. Breakfast is phenomenal but I was told their shrimp for dinner is the best on the island. Great location! So close to restaurants, stores and beaches. I went running to Kailua Beach every morning, only 1/2 mile walk to Kalapawaii Market and Island Snow shaved ice, as well as so many great restaurants. Lanikai beach, Pill Box hike and Kalama beach is also just a few minutes away. Target or Longs Drugs is close to get any forgotten items or to just not pack a whole lot and buy things there. Most hospitable hosts that made you feel like family. The backyard is so welcoming with a pool and jacuzzi. Beach towels and bath towels are ready for you. Use of beach toys, chairs and other gear is also available. They made sure that when we arrived the house had a good start of food so we didn't have to worry about shopping right away. The place might be cozy for 5 people but the outdoor space was enjoyable. The outdoor shower came in handy when we came back from the beach sandy or back from a hike muddy. The washer and dryer was also very useful to get bathing suits and wet clothes cleaned and ready for another use. You don't need to pack a whole lot because there is so much provided. We really enjoyed our stay and used the amenities of the house to it's fullest. It really was so welcoming and convenient in it's location for a quick stop between excursions. We would totally stay there again! !